The Australian nursery industry now has easy access to an online resource to help them with pest identification and management, both in the field and in the office. The Pest Identification Tool: Insects, Beneficials, Diseases, Disorders and Weeds provide users with information to help in identifying and treating the pest issues encountered in nursery production. It was developed by Nursery & Garden Industry Queensland, with support and assistance from Queensland Department of Agriculture, Forestry & Fisheries, Nursery & Garden Industry Australia and Horticulture Australia Ltd. The new online tool is accessible by computer, smart phone or tablet. This makes the information portable and easily accessible for the user – a virtual library of practical, relevant information at your fingertips. Colour photographs are provided to assist the user in recognising pests and plant disease symptoms. There is also advice on diagnosing diseases, integrated pest management, beneficial insects as biocontrol treatments, insect pest life cycles and plant disorders. Potential uses for the Pest Identification Tool in supporting nursery on-farm operations include the monitoring of pests, diseases, disorders, weeds and beneficials, the management of endemic plant pests, the inspection of incoming stock at receival and the inspection of stock at dispatch. A great feature of the tool is the option to search for and identify plant diseases according to the host plant and its disease symptoms. Additional information will be added to the resource as it becomes available, including more images of plant disease symptoms and information about new pest threats. This ongoing expansion of the tool will lead to an increasingly comprehensive, up-to-date and practical library of pest-related information for Australian nursery industry owners, managers and staff. Users can access the new information resource by registering on the website www.pestid.com.au and paying a small yearly subscription fee. A discount of 40% is available for members of the Nursery & Garden Industry (Qld, NSW/ACT, Vic, Tas, SA, WA and NT), or 60% discount for businesses that are accredited through the Nursery Industry Accreditation Scheme Australia (NIASA). To access these discounts please contact your Industry Development Officer for the discount code. Further discounts are available for group subscriptions, which can allow multiple staff in a nursery business to access the resource. 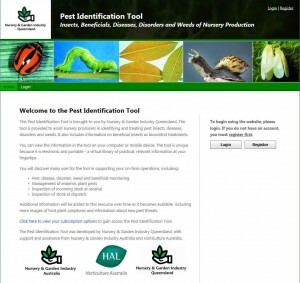 The subscription options to access the Pest Identification Tool are outlined below.